Viezu technologies are proud to announce our Fully Customised ECU Remapping for Jaguar F Type tuning, Viezu Technologies, are one of the leading vehicle remapping companies in the UK, and we have one of the fastest grow rates in the aftermarket vehicle tuning industry ? who better to undertake your Jaguar F Type tuning and remapping. 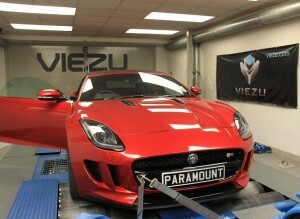 Viezu Technologies have been working on new and improved performance maps for Jaguar F Type tuning since it was launched, and we believe that we have now truly created an outstanding range of tuning for the Fantastic F Types, no matter what model of Jaguar F Type, be it the 3.0 V6 F Type or the 5.0 V8 F Type, our tuning will transform the driveability and performance of these Fantastic sporty Jaguar F Types. Paul Busby, CEO, Viezu, said: ?To have created a Performance tuning service transforms the already outstanding F Type is a joy to behold. When we create our new Jaguar tuning services they were made with our loyal and highly enthusiastic jaguar clients in mind, At Viezu customers are the most important part of our business and we look at our Clients as if they were part of the family. And as part of our family we want them to go away with a memorable experience and a smile on their face.